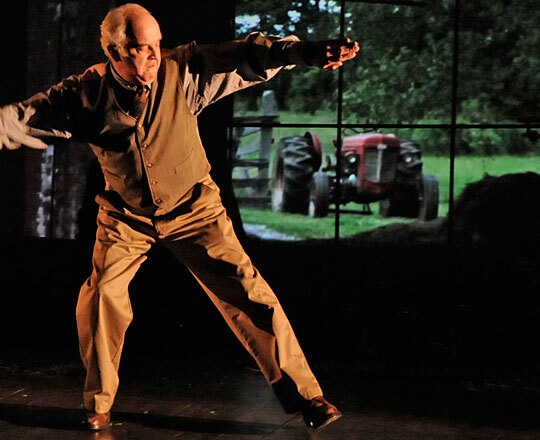 Theater - 'Wild Blessings': Wendell Berry's Passions, Reframed The Actor's Theatre of Louisville puts the agrarian philosopher's environmental poetry onstage with Wild Blessings: A Celebration Of Wendell Berry, premiering at the Humana Festival. Larry John Meyers hacks at tobacco while performing Wendell's poem "Rising" in a technical rehearsal of Wild Blessings. 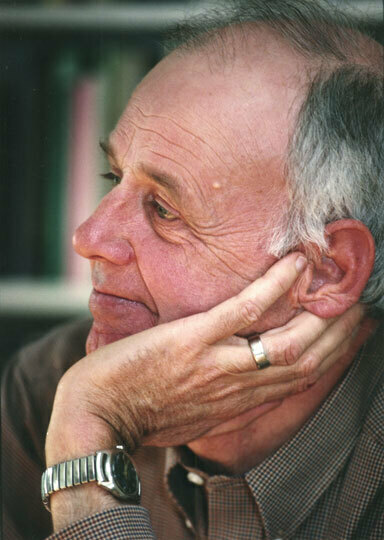 Wendell Berry has been compared to nature writers like Thoreau and Emerson. 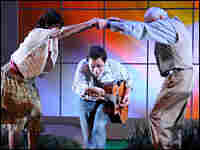 Tracy Conyer Lee (left), Phil Pickens (middle) and Larry John Meyers (right) tread a measure while performing Berry's "The Dance" in Wild Blessings. Wendell Berry, the Kentucky-based agrarian philosopher, has been described as our era's heir to Emerson and Thoreau — a writer concerned with the importance of community, and with the lessons we can learn from the natural world. Now, the Actors Theatre of Louisville is putting his ideas on stage. There were plenty of ideas to choose from: Since the 1960s, Berry has published eight novels, dozens of short stories, and numerous essays with environmental themes. But Wild Blessings, the theater piece premiering this weekend at the Humana Festival of New American Plays, is drawn exclusively from Berry's poems. Plenty of playwrights write in verse — but not every poem would work on a stage. Even Berry himself had his doubts when the Actors Theater came calling. "I didn't know what to think," he says. "I still don't know what to think. ... After I see it I guess I'll have an idea." Not to worry, says Adrien-Alice Hansel, who helped put Wild Blessings together. She says Berry's poems worked perfectly as fodder for a play. "He actually writes in a lot of different voices," Hansel says. "He has poems that are invocations of the natural world. He has poems that are funny. He has poems that are angry. And some of his poems have a really strong sense of voice and sense of character." One such character is the "Mad Farmer," a man Berry describes as "a little extravagant" in his willingness to go against the grain. Thumbing through the script, he reads one of the adapted poems — one that, to him, sums up how he and the Mad Farmer both see the world. Wild Blessings weaves Berry's poems together with original music by composer Malcom Dalglish, who speaks and plays instruments onstage. 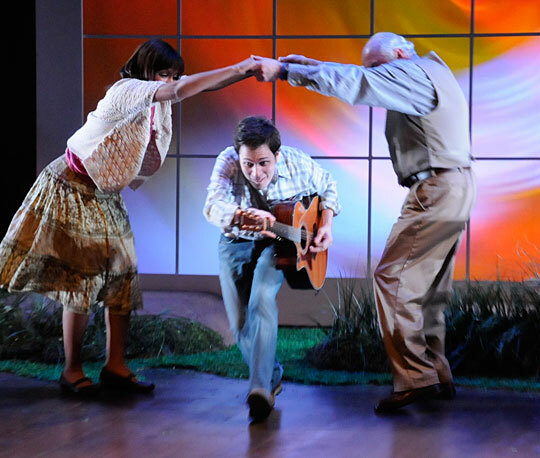 Four actors, who also play instruments, present Berry's characters and life. 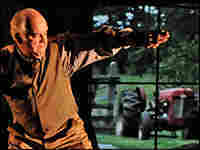 The arc of the play mirrors Berry's own migration: Born in 1934, he moved away from Kentucky in the late '50s to live in California and New York. Ultimately, though, he returned to his home state, where since the '60s he's been living the kind of agrarian life he writes about. For playgoers, "the journey of the evening is [about] being a young person in the city and struggling against urban life, and then falling in love and moving back to home, which happens to be Kentucky," says Marc Masterson, artistic director at the Actor's Theatre. usury, seduction, waste, and ruin. Though mortal, ignorant, and small. The world is whole beyond human knowing. When Berry considers the current state of affairs against the work he's produced over nearly half a century, he seems reflective. "I have hope," Berry says. "I've devoted a lot of time in my life to discovering the grounds for having hope. But that doesn't mean that I'm optimistic." Actors Theatre may have reason to be, though: The company has already fielded calls about Wild Blessings from other theaters, both in the U.S. and abroad. Elizabeth Kramer reports from member station WFPL in Louisville.